Coordinating your next potluck event just got a little easier, thanks to a Pensacola State College web administrator, Frank Asprer. 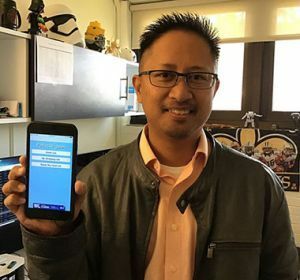 “I created an app with three separate lists that anyone hosting a potluck or party can keep track of guests, shopping items, and thank you cards,” explained Asprer, who is excited that his PotluckPigeon app is now available in the Apple iTunes store. Asprer said he has always wanted to publish his own application software, or app, in the Apple iTunes store, but that it is not as easy as it sounds. “Not only does the developer have to code the app, but he or she also has to create all the graphics for the icon in different sizes, as well as screenshots of the app for the app store,” Asprer said. Navigating coding errors provided some additional frustration for Asprer, but he said that he found satisfaction in finding solutions to his issues. “I like to be challenged so when I figure out how to fix an error or get something to work in the app, it feels so rewarding … like when you solve a puzzle that you’ve been working on for the longest time and find that last piece to make it complete,” he said. Asprer began his career in the information technology (IT) field selling software and video games in Cordova Mall while he was pursuing a bachelor’s degree in Computer Information Systems at the University of West Florida. After graduation, he worked his way up from system administrator to webmaster with a local credit union. Now, he offers his expertise to Pensacola State as a web administrator. Asprer said he was surprised to receive the email from Apple telling him his app had been approved. “The most exciting part was searching for my app in the Apple iTunes store and seeing it appear with my name on it!,” he added. Asprer plans to continue working to improve the PotluckPigeon app and is developing another application that will allow users to keep track of their own personal fishing spots. He also shared his advice to those considering developing their own software applications. “Start small and simple. Don’t get too complicated at the start. Build up from there, and then add all the bells and whistles later when you have everything established,” he explained.